Two-time British designer of the year, Hussein Chalayan knows how to amaze his fans with his intellectual take on fashion. His conceptual pieces will always inspire horde of fashion designers, who probably still look with glittering eyes at Chalayan‘s famous ‘coffee table dress’, or his futuristic ‘womb’ worn by Lady Gaga in 2011. 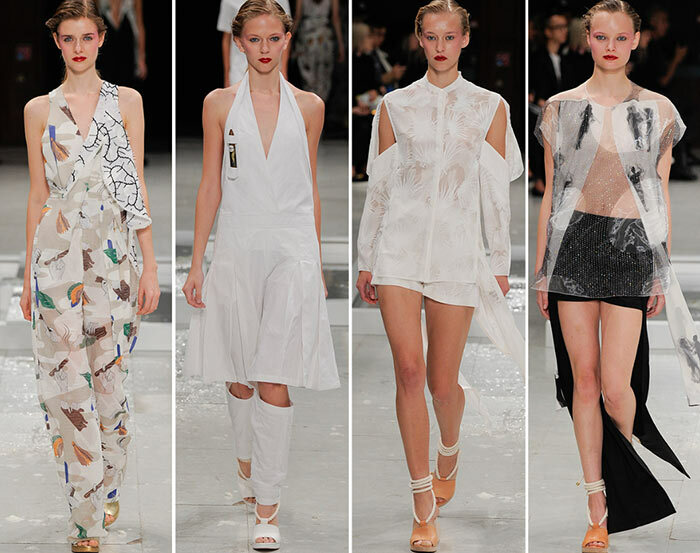 Transformation, experimental arts and conceptual fashion have always been the designer’s trademarks, and have been explored to a great deal even for the Chalayan spring/summer 2016 collection. Since his very first debut Chalayan has collaborated with architects, textile technologists, and even engineers, becoming one of the best 360 degrees designers of all time. The Cyprus-born British designer, who last year relaunched his menswear line after an 8-year break, has this year celebrated his 21-year-old career giving us one of the most experimental and innovative ready-to-wear collections seen so far. “Everything is about the body. I think that the body is the most important cultural symbol, and I think with the body you can tell a lot.’ That’s what he said just a few hours before launching his spring collection, and it is not that hard to understand why. Chalayan’s models, who are used to getting interacted with furniture on stage, have this time proven that fashion can be not only sustainable and ecologic, but also exciting. Wearing what looked like a paper-lab coat, two models walked down the catwalk, stopping at the middle to take a shower. Their coats started melting immediately, disintegrating little by little and quickly revealing two different elegant cocktail dresses underneath. 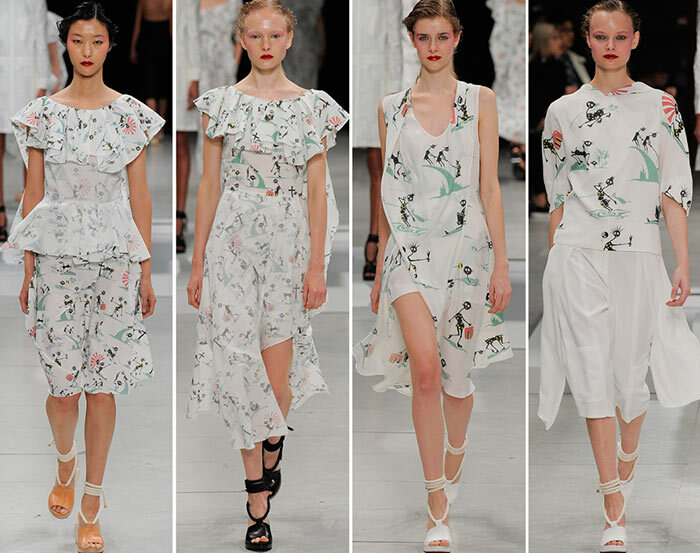 Surprisingly, even though the audience surely had fun watching the show, this pair of soluble outfits was not the most interesting pieces of the Chalayan spring 2016 collection. 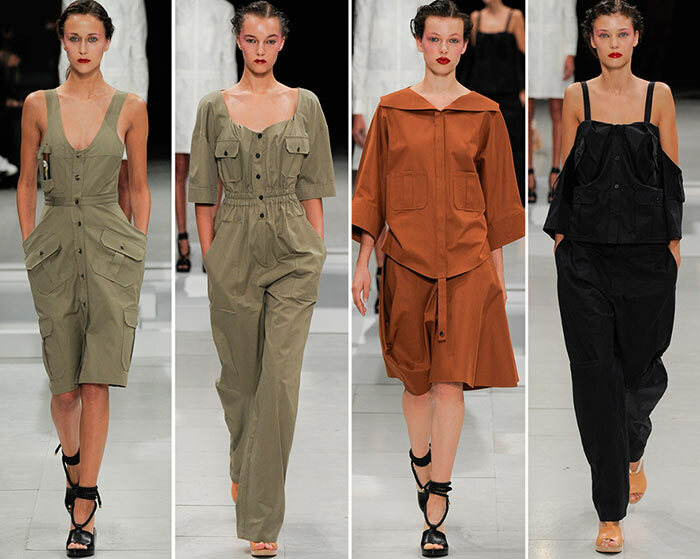 Being inspired by his latest menswear line, which took great influences by the Cuban culture, the first part of the collection features some perfectly tailored short and long khaki overalls, along with some deep Florentine-neckline khaki wrap dresses and brown mannish suits. The other part of the line-up mainly consists of dark-blue and white printed dresses that make the collection take its more conceptual and feminine turn. Each piece unveiled denotes Chalayan’s passion for deconstructed and structured lines and cuts, which have been skillfully combined with layered fabrics, deep plunging V-necklines and strategic cut-outs. White palazzo pants and oversized capes almost look like ethereal dresses, and give the collection not only fluidity but also a connection with his shower experiment. 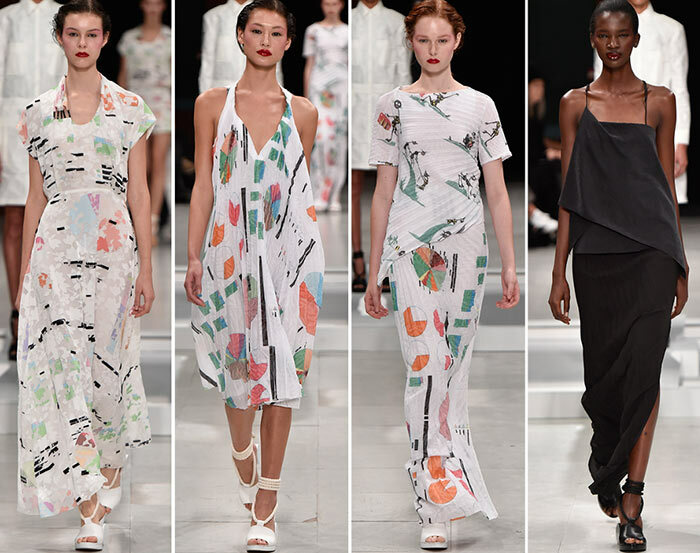 Graphic prints of stick men, birds and Dadaistic figures remind us of the most cheerful side of fashion, while vein-looking prints may be linked to Chalayan’s main motif: the human body (and really look like an underground map of our blood system). Printed dresses and total-black pieces alternate each other, managing to put a great emphasis on the great amount of exposed bare skin, which looks more radiant piece after piece (and probably finds a good ally with Chalayan’s decennial collaboration with Swarovski). 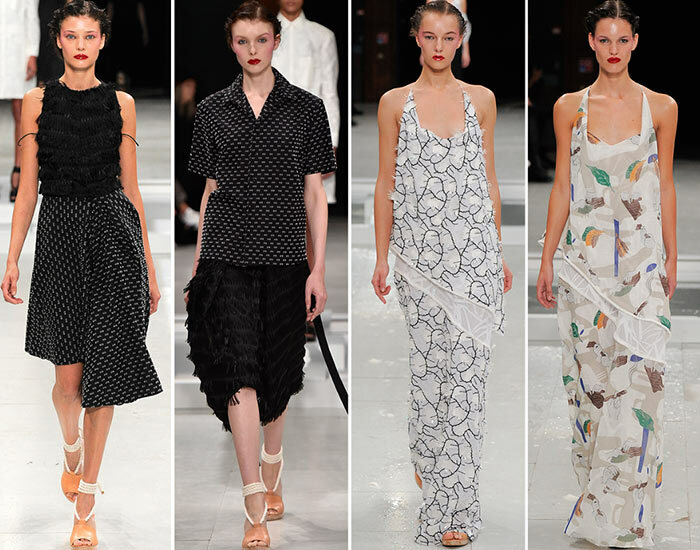 Last but not least, it is interesting to notice how Chalayan choose to put some Fifties motifs into his collection, as proven by some sweet short dresses and A-line skirts with polka dot prints. As usual, Chalayan’s fashion show has been, indeed, a great show.